Purpose of EVA: Usage of rovers for battery discharge, aerial mapping of terrain, testing of mid-range EVA protocols, testing of the Guache I Rover, Collection of possible halophile samples. Narrative: One successful EVA was undertaken on this day. A crew of 4 departed the habitat at 11:35, aiming for the two main goals of discharging the rover’s battery and to keep testing the different projects. After taking Cow Dung Rd for about 30 minutes, the crew arrived at Quarry Road, where several aerial shots were taken, testing the 3D mapping software, as well as a first field run of the Guache I rover. 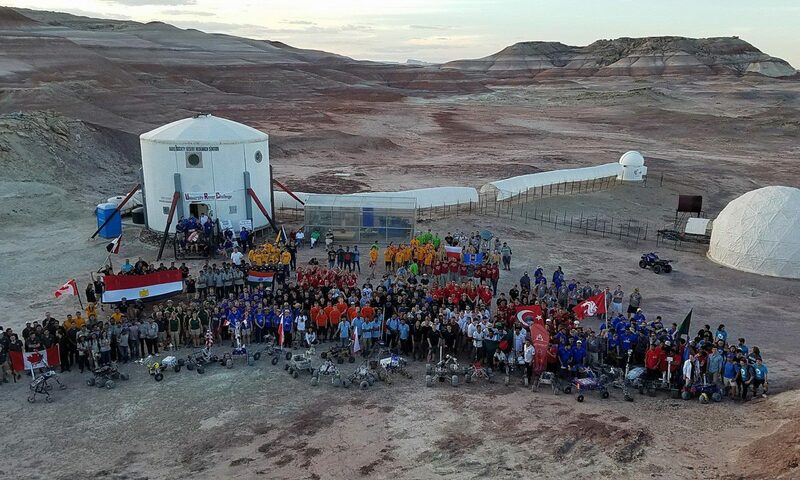 On the way back, the crew stopped on two more locations to perform the same activities, taking aerial footage, and testing the Guache I rover performance over different types of terrain. The expedition never left the main road for more than 20 meters. No halophile samples were taken, because no relevant sites were found during the expedition. The batteries of the rovers were discharged, and in particular, opportunity dropped to 55% during the traverse. The crew entered the airlock at 13:55 and finished the EVA.